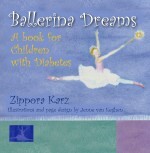 This is a story of Zippy, a young girl who falls in love with ballet. With hard work she dances all the way to her pointes and the leading role in the performance. But soon Zippy and her family learn that she has type 1 diabetes. Will she still be able to dance in the performance? Zippy proves that she can take care of herself and still live her dream.